The insane religious-fanatic Zionists who have been trying for years to start Armageddon have failed yet again in their latest attempt, this time in Syria. They now face serious repercussions, possibly starting with a revolution in France. Before we get into the details, let’s remember what it is we’re dealing with here. It is difficult for sane, reality-based people to understand that the Western political and financial establishment has been hijacked by religious fanatics who are trying to carry out their interpretation of Biblical prophecy with the murder of 90% of humanity and the enslavement of the survivors. Nonetheless, overwhelming evidence shows this is exactly what is going on. We will not lay out, yet again, all the evidence here; we will just look at what U.S. President Donald Trump’s son-in-law Jared Kushner has been up to. The Kushner family bought a building on 666 Fifth Avenue in New York at way above market prices. At this point, it is worth reminding readers that this verse is from the New Testament and not the Jewish Old Testament, so this is not a Jewish plot and these people are not real Jews, but rather worship Satan. Once again the old adage, “Truth is stranger than fiction,” is turning out to be true. After meeting these people, Donald Trump signaled his reluctance to go along with their crazy plot by announcing the U.S. was going to withdraw from Syria. So what happened? Why did Trump suddenly order the attack on a Friday the 13th, of all dates? The answer, according to CIA and other sources, is that the Khazarian Zionist crazies, desperate as their control grid collapses, carried out a massive campaign to force the U.S. and Russia into World War 3 and thus start their long-planned Armageddon. The key was the raid on the offices of Donald Trump’s lawyer, Michael Cohen, on April 9th. The aim of the raid was to find material with which to blackmail Trump and thus force him to order an attack on Russian troops in Syria and start WW3, according to CIA and Pentagon sources. Since Trump’s Atlantic City casinos went bankrupt in 1991, 1992, 2004, and 2009 and since Trump was likely to have been bailed out by Russian gangsters and other dubious characters, there can be no doubt that plenty of blackmail material was found. The U.S. military responded by posing for the following picture on the night of the raid. 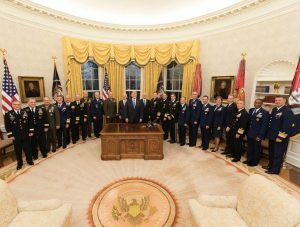 “The message is that the U.S. military is solidly behind president Trump,” and “the message to the cabal is indicated by 9 on the left and 11 on the right,” Pentagon sources say.